Single storey detached lodge with uninterrupted loch views and large decked area. Have been going to Appin Holiday Homes for over 25 years now and it has always been a relaxing and beautiful place. The owners - Jim & Julie always make us feel very welcome and nothing is too much trouble. The Lodges all have beautiful views across Loch Creran. The back of the cabins is the old disused railway line and is great for walks (with or without a dog). Loch Creran is right on the doorstep and is good for fishing (no permit needed). Our 2 children (10&11) have both fallen in love with the place and we can't wait to go back! An exellent stay, lodge was lovely and clean with nice little touches like dvd's coffee tea and biscuits. Had a brilliant view of loch crearan , and good weather to top it off . Definitely think of coming back to stay. A comfortable lodge with everything you need for a stay in the area. Only one issue. On arrival with food for our stay we found the fridge was turned off. The lodge instruction book stated that it needed to be turned on but it has been turned off at the plug under the unit so we had problems. It would be more welcoming if the fridge was turned on in the morning ready for the arrival of the next guests. Welcoming friendly site lodge was lovely shame about the oven. Every thong else was ok . Great for a short stay. We took our two dogs on holiday, beuatiful scenery, friendly owners, lodge was great felt like a home from home. Very friendly and peaceful holiday. Great weather and scenery. Ideal place for pets and walking away from cars. Nice location and nice cabin lodge. Everything was clean and functional. WiFi only worked reliably in one room. Otherwise met all our expectations. Dogs loved it and some nice paths on the grounds to walk the dogs. We spent a week in the lodge and found everything clean and tidy and well presented the lodge was well equipped. Being used to a king size bed we found the bed a tad narrow and not very comfortable. The water pressure was poor also so the shower wasn't great. The lodge was warm and cosy in the evenings. Overall though we loved the location and the amazing views and some fab places to eat nearby. The view is unbeatable, the noisey road was not evident from the blurb, most of all the place needs a new bed (coming apart ) new mattress ( deid) sofa, ( see matress) kitchen blind ( broken and rolled up ) bathroom blind ( filthy and stained) as was the 3 legged dressing table stool which had years of stains on the cover. Most of the surfaces had significant dust and in some cases dirt deposits. Wouldn't take a lot to fix but looks like that if your getting £400 for3 nights why bother? Spectacular views, a cosy cabin and a very warm welcome from the owners. Already booked a return visit. John & Leah. Lovely views over loch ideal location . Pet friendly which is a bonus and enclosed verandah lovely walks ideal pub nearby for good food . We try to get up to Appin Holiday chalets at least twice a year - one definitely at New Year. It is a home from home and a great way to re-charge your batteries. The scenery is fantastic and you are only 20 minutes from Oban or Fort William. Can't wait to get back! Appin Holiday Homes provides pleasant lodges in a beautiful part of Western Scotland, with attractive countryside nearby and convenient for Oban and Fort William. The Creagan Inn is a short walk, very convenient for dinner. We brought our cats with us to Otter Holt lodge, one of the lodges in which pets are permitted. Unfortunately the main road, though traffic was light, was too close to allow our cats to wander freely outside the lodge (would not be an issue with dogs if you walk a dog on a lead). The living room with integrated kitchen is well appointed, with a very good range of pans and cooking implements. There was a good TV with FreeSat and a DVD Player. We did have to physically change the connection from the TV to either the FreeSat box or the DVD player (only a single Scart connection on the TV). We found the double bed in the main bedroom comfortable (fairly firm), the single beds in the second bedroom a bit less comfortable (that may just have been individual preference). Overall very good value for the accommodation provided. A wonderful Holiday once again. Once again we had a wonderful time at Appin Holiday Homes. We have been several times over the past years and will come back again. A great place to stay for outdoor loving families. Nice view of the loch and a pub in walking distance. Only fault was that it was a drive to the nearest convenience store . Beautiful views over the loch, a nice pub just a short walk down the road, an even better pub(the old barn) 5 minute drive away. Location is perfect for many local walks as well as being in a good situation to get to other tourist places. For example On an is 1/2 hour away. Just make sure you being food as the nearest shop is 12 miles away! We stayed five nights in Otter Holt Lodge. 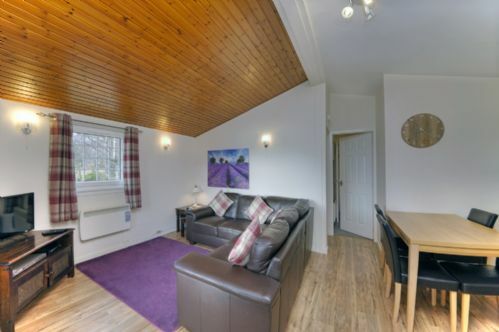 It is a nice, comfortable chalet, with good views over Loch Creran. When the traffic settles down it is very peaceful. The site is very pleasant, with the well looked-after remains of the old station included! The Creagan Inn is an easy five minutes walk from the site and offers an excellent menu, sufficiently varied to bear several visits, and good beers too. Unfortunately it was some little details (which could be easily fixed) that took the edge off our stay. For example, on arrival there was no-one in reception - TIP - take the owners phone number with you and call him if it happens to you! Once in the Lodge, the fridge hadn't been defrosted properly and we spent some time clearing that up, not a good start! Also there was no toilet paper - fortunately we had a contingency supply with us, as the nearest shop is some miles away and would have been closed anyway. Only one cleaning cloth was provided, to cover both bathroom and kitchen, not what you'd expect. So in summary a nice place for a short stay, but offset for us by a few little things that took the shine off it. Hopefully they can be fixed for your stay. Deceptively spacious. Loved the deck and view. I liked the fact that there was no wifi except in the games room- meant that we had proper family time when in the lodge! Very handy for both mountains and golf courses- we alternated the day's activities. Had a great short break...the lodge was comfy, and had everything we needed. Great location and views. Nearby pub with restaurant and site is well located to get around to app in, lies ore, Oban and glencoe. Would go back. Enjoyable stay especially for walking and cycling enthusiasts who like to explore the beautiful surroundings. Lodge and furnishings comfortable, but water pressure for shower or washing dishes was weak. What a view from our lodge ! Worth the money alone plus we got to the Appin Show and the evening ceilidh to burn off the calories piled on by dining at the Creagan Inn a short stroll away. Don't miss a trip into Oban or even up to Fort William and the Anoch Mor cable cars to the restaurant some 2,000 feet up. The owners, Mr & Mrs Weir, couldn't have been more helpfull. We'll be back. John & Leah from Glasgow. First visited these lodges 30 years ago with my grandparents. The location is excatly as I remembered, stunnning. The lodges are very comfortable, spacious and well equipped. Recommendations in the lodge info book were very helpful especially places to eat locally. The Pier House at Port Appin has one of the best restaurant views I have seen. Staff at the lodges were helpful and made us feel very welcome. Basic accommodation with no frills, which did not justify the rental cost. We'd just stayed in cheaper accommodation on Skye which was far superior. The property wasn't very clean, with dust on the skirting boards and the glasses were not clean. Several of the doors in the property didn't fit properly so were very loud. The standard of maintenance/ finish was generally low; unfilled holes in walls from replacement items. Musty smell in property, probably from the vacuum cleaner which was very loud and quite ineffective. No bin-bag provided. A request to recycle, but no facilities to do so. Table and chairs very wobbly and creaky. External park grounds near road-side attractive, but totally barren elsewhere and there's a pond with stagnant water a short distance from this property which desperately needs more flow through it. Hi there and thank you for your review. We are sorry you did not find Otter Lodge as adequate as your property in Skye. In each lodge we provide a welcome tea/Coffee basket, toiletries, toilet roll and basic cleaning materials which should have included a bin bag so I am sorry if this was missed. Having visited the lodge after your review I am perplexed about the unfilled walls comment with holes as I could not find any at all? Outside your lodge is a wooden box which contains three bins for recycling so am not sure how you could have missed this. Again we are sorry if you were unhappy. thoroughly enjoyed our stay,only thing missing for my partner shops and for me a boat to catch some fish on the Loch Creran. But we will be back again. Thank you for the lovely review of Otter, I will give some of the big shops a ring and tell them to get to Oban ( there has been a rumour that M & S might be moving in)! It will be lovely to welcome you back any time. We had lovely time during our stay at Appin Holiday Homes. Jim the owner was very friendly and helpful. The views out over the water were spectacular and even the weather was quite kind to us. Even managed to dine al fresco a few times at Creagan Inn! Didn't travel too far from chalet but we managed lots of lovely walks with our dog. Went to Lismore and down to Bendenloch for walks along the beach. Cafe there was also very good especially the strawberry milkshakes made with real ice cream! Thank you for the lovely review on Otter Lodge. We are so glad you and the dog enjoyed your stay and made the most of all the lovely walks nearby. Have to agree with you about the milkshake! So glad you enjoyed your stay and found our location convenient and peaceful. Thanks for reviewing us. My husband and I have stayed at appin holiday homes on previous occasions over the last 10 years. This is a great area to explore the highlands of scotland central to Oban and Fort WIlliam.Lovely walks, and plenty of history.Before you arrive at your accommodation, the owner will switch lights on and turn the heating on ,making sure you feel welcome.The owner will call to make sure you are settled, and after that you are left to enjoy your stay.We always feel comfortable, a home from home feel. Everything you need within the lodge, to make your stay stress free. This holiday was all about location,Fab-u-lous.Even in the poor weather,looking out to that view every morning was amazing.The actual lodge was comfortable and clean,but definitely in need of renovation.Poor quality bed linen,very poor shower,no torch,well used kettle,and a few other nitpicking things,maybe somethings because end of a busy season,but it was comfortable so still enjoyed it. A very lovely place for anyone to go, excellent staff ? I think they may owe the wife and I a meal? Overall really good area for touring. many thanks from Margaret and Ray Hunt. Thanks for the lovely review. We really enjoyed our lunch !